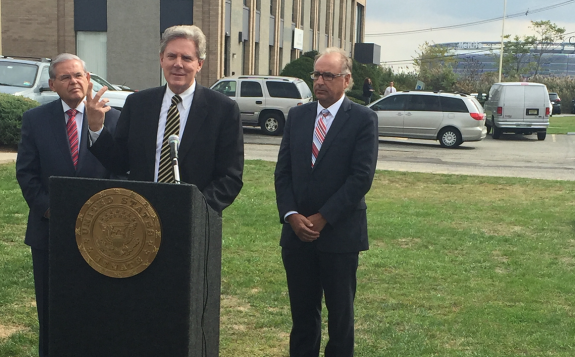 Two of New Jersey’s elected federal officials, US Senator Robert Menendez and US Representative Frank Pallone, continued their joint call for federal action and oversight of the US-based daily fantasy sports (DFS) industry with a press conference within shouting distance of the New Jersey-based Meadowlands Sports Complex. The two federal officials were joined by East Rutherford, NJ mayor James Cassella in issuing the call for oversight, in an ongoing effort to drum up support for Congressional hearings on DFS’s presumed legality. The industry sprang to life this decade as a result of a “fantasy sports” loophole in the 2006 UIGEA (Unlawful Internet Gambling Enforceent Act),which bans the use of the US banking system as a way to fund wagering in many other forms of online gambling. However, in the wake of last week’s revelations that market leaders DraftKings and FanDuel may have lax internal controls over certain user data, possibly allowing the sites’ own employees to wager profitably against the industry’s general customer base, calls for reform have been widespread. The press conference follows last month’s call by Rep. Pallone for the US Congress to hold hearings on the same issue, and also comes after Pallone and Menendez sent a joint letter last week to the head of the Federal Trade Commission, Edith Ramirez, on the same topic. Menendez and Pallone also have their home state’s ongoing interest in legalized sports betting at heart, as New Jersey continues to battle the ongoing federal PASPA ban against more traditional sports-betting activity in the state. 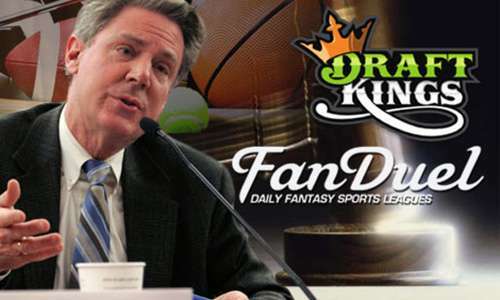 Menendez and Pallone have both questioned how DFS can be legal and unregulated while their state’s own voter-approved sports betting plans continue to be stymied by the efforts of the US’s major professional and sports associations, who not coincidentally are finding ways to profit from the new DFS offerings. Today’s conference was held within eyesight of the Meadowlands, which is home to both the NFL’s New York Giants and New York Jets. Pallone and Menendez are likely to continue hammering the DFS issue in coming weeks, which is one of sevral different areas of concern for the sites. State and federal interest in the ongoing situations at the two leading DFS sites continues simmering, and at least three DFS sites (including the PokerStars-affiliated StarsDraft), have stopped serving Florida customers after that state’s attorney general expressed doubts about the industry’s legality there.